Glove Plus Powder free vinyl is recognised as a high quality, high performance vinyl glove designed for use in areas where there is no risk of chemical splash to the glove user. Powder free vinyl offers the glove user a comfortable glove with low levels of protection against chemical splash and are ideal for use in a wide range of applications where the gloves are used primarily to keep hands clean and for short periods of time. Whilst there are some chemicals that Glove Plus powder free vinyl gloves are an extremely effective barrier of protection, glove users are advised to consult their in-house technical data before using any vinyl product in contact with chemicals. Where vinyl gloves are used for contact with chemicals, insist on a product with a high Force at Break and low watertight AQL pinhole level of a maximum of 1.5. Powder free vinyl is manufactured to a watertight AQL of 1.5 for ‘pinholes’ which ensures a lower instance of tearing and product failure. Powder free vinyl gloves incorporate a rolled (beaded) cuff which reinforced the cuff area to prevent tearing when putting the glove on and also allows for a secure fit to garments, helping prevent liquids entering the wrist area of the glove. The component materials in Glove Plus Vinyl comply with 27CFR 177. 2600 which means that these gloves are safe for use with food. Being made from Vinyl, a man made material, Glove Plus Powder free vinyl are 100% NR Latex free which means there is no risk of Type 1 allergies and are powder free to help prevent general skin irritation during use. Many vinyl gloves are produced using a plasticiser known as DOP or DEHP which helps to keep the material soft and comfortable during use. This chemical is on the REACH list as being harmful to human health. Glove Plus Powder Free vinyl gloves are 100% free from DOP (DEHP) without losing out on comfort. 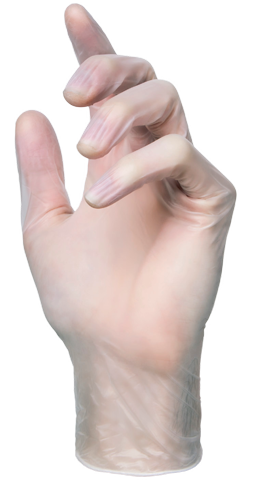 Powder free vinyl gloves provide the level of comfort you would expect from Barber Healthcare and are manufactured using the latest, super soft vinyl formulation. Available in sizes Small (6-7) to X. 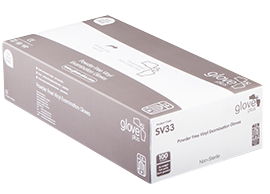 Large (9-10), Vinyl gloves are packed in dispensers of 100 gloves, 10 dispensers per carton.